The problem with any Cajun place that opens up in Auckland is that we will immediately be comparing it to Sweet Mother's Kitchen in Wellington. 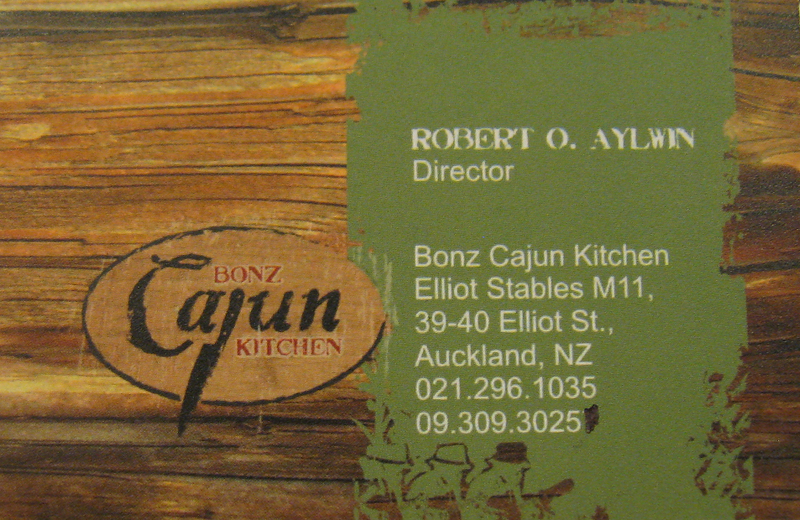 Not surprisingly, when Bonz Cajun Kitchen appeared in Elliott Stables several months ago, our first thought after "Awesome, a Cajun place in Auckland!" 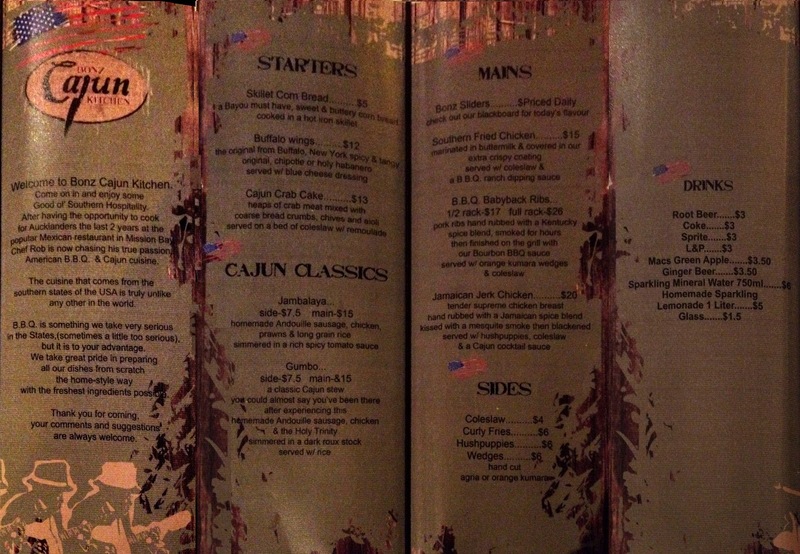 was "But where are the po-boys, dirty rice, beignets and key lime pie?" 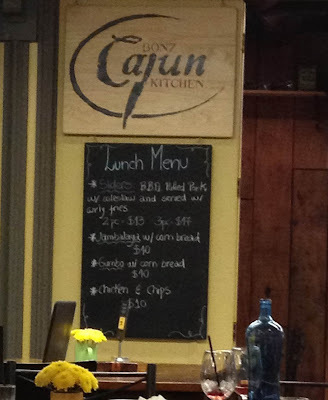 It's true that Bonz Cajun Kitchen has a limited menu, and as part of an upmarket foodcourt, it also lacks the quirky charm that Sweet Mother's Kitchen exudes. The chefs do, however, cook their few dishes well, and the lunch deals are very reasonable with a number of items at $10 (though the portions will be on the small side for most people). Gumbo and jambalaya with corn bread for lunch. We ordered a coleslaw as a side. 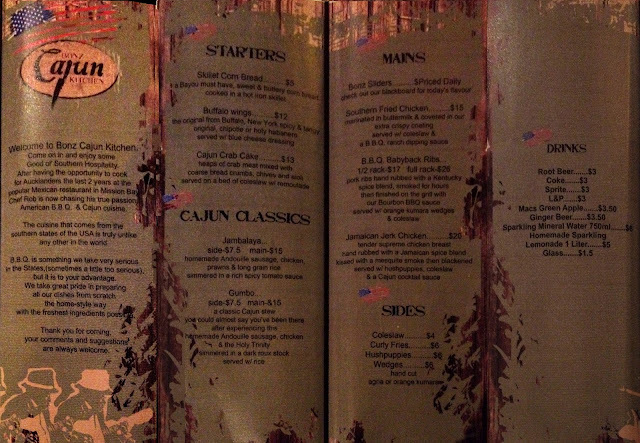 Apart from the Cajun classics of gumbo and jambalaya, Bonz also offers other American dishes such as sliders (small burgers which I first came across at Depot), Southern fried chicken and BBQ babyback ribs. If you are going to be ordering one of the $10 lunch specials, we would recommend getting some starters or sides to share as well. It's a good excuse for trying a few more items off the menu. Hush puppies, and buffalo wings with blue cheese dressing. This little eatery is small in many ways, but it is great to see it joining the ranks of places offering unique and tasty food around Auckland. There aren't that many items on the menu, so just go for what you like. Unfortunately, none of the mains are vegetarian. If you don't fancy coleslaw and cornbread or hushpuppies, you might need to try another stall at the food court. Bonz Cajun Kitchen is situated in Elliott Stables. I love the new look. Especially the panda fav icon! I have a major crush on the food from the US southern states and this looks great. The small portions are a worry though. I'm sure southerners would not approve. Still, small portions are a good excuse to order several dishes. Thanks, Genie. I don't have your mad design skillz, so just trying to improve things slowly. I loved the cartoon bunnies you used to have, though I guess your new banner is more sleek and modern. I arrived there as part of a group, they misplaced my order and when I queried them about the order, the incredibly rude staff blamed me. No apology, just asked to leave or order something else. I felt like I was in a Fawlty Towers episode, verbally abused by none other than Basil Fawlty himself. Please stay away and spare yourself poor service and abuse from the staff. I guess they are not used to large groups in a food court, but it does sound like they have customer service issues. Hopefully they'll sort that out quickly so you can go back and feel good about enjoying their food.